NETWORK FINALS: HAWAII 5-0 gained 0.1 in final numbers, but both the new and rerun episodes of MASTERS OF ILLUSION lost the same. CABLE HIGHLIGHTS: Lifetime led another slow Friday on cable, as THE RAP GAME rose 0.03 to 0.53, and BRING IT slipped 0.02 to 0.48. Adult Swim’s ERIC ANDRE SHOW lost 0.06 to 0.46. Nickelodeon’s late afternoon LOUD HOUSE was up 0.06 to 0.42, and Disney Channel’s primetime GIRL MEETS WORLD returned at 0.40, preceded by twin 0.29s for ELENA OF AVALON and LIV & MADDIE. A pair of COLLEGE FOOTBALL games hit the Top 10: ESPN with TCU vs. SMU at 0.41, and Fox Sports Net with USC vs. Utah at 0.34. On Food Network, DINERS, DRIVE-INS & DIVES gained 0.06 to 0.33, and BURGERS, BREW & QUE was up 0.04 to 0.28. Discovery’s BERING SEA GOLD ticked down to 0.33. 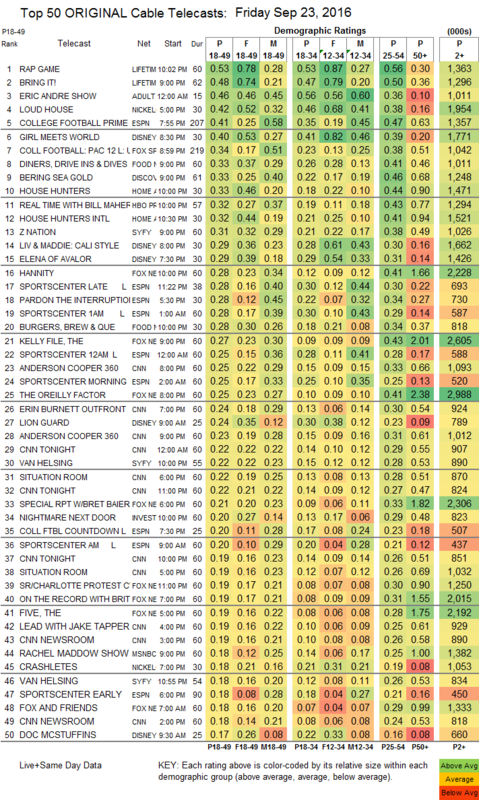 On HGTV, HOUSE HUNTERS was at 0.33, and HOUSE HUNTERS INTL was at 0.32. 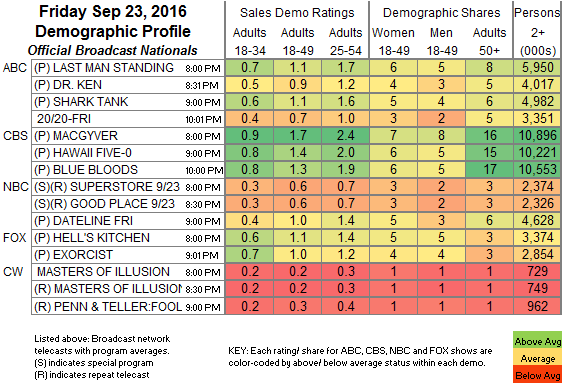 On HBO, REAL TIME WITH BILL MAHER climbed 0.03 to 0.32, and HIGH MAINTENANCE fell a tick to 0.11. On Syfy, Z NATION’s 0.31 (up 0.01 from last week’s 2-hour season premiere) was followed by a 0.22/0.18 premiere for VAN HELSING (really a quasi-premiere, since it had aired as a “sneak” in July). Bravo’s REAL HOUSEWIVES OF MELBOURNE dropped 0.03 to 0.09. Cinemax’s QUARRY was steady at 0.06.